Stage 3. the shoes quilt. It's important to have a good print of the image to refer to as you quilt. You know in reality I will be drawing with the thread. The angles of the stitch lines are as important as a pencil line. I use a high gloss photographic paper to get the best resolution on the photo. I've just gone through my threads and chosen the colors which are as the closest match to the photo. I'm using a combination of Superior masterpiece 50 weight cotton and Superior trilobal polyester. You may think it strange that I'm using two different genres threads… but I'm doing it for the textural and different visual effect. Tagged with: Superior threads. Preparing the quilt. Previous PostStage 2, Shoes quilt. 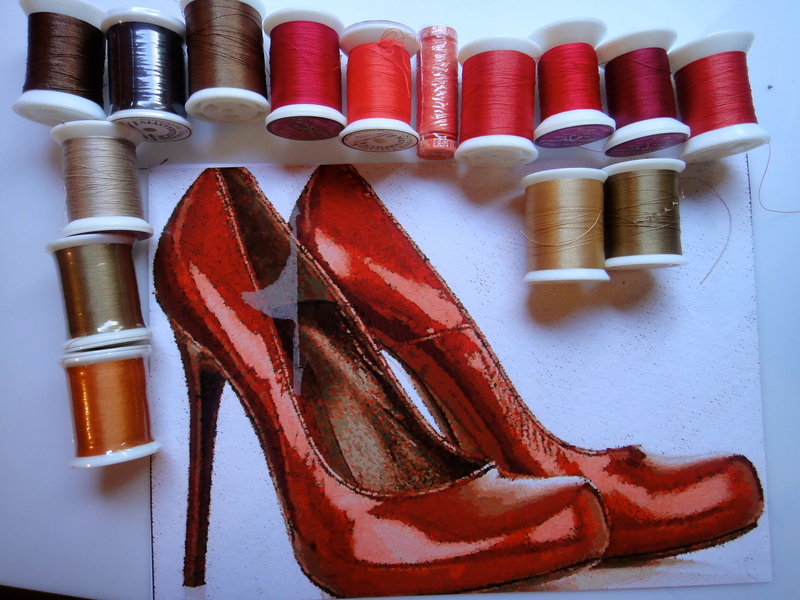 Next PostStage 3. the shoes quilt.